Blinkster is a free, simple and accessible software answering directly to our daily need for informations through the resources of the internet. it uses heuristics to give relevant answers to frequently asked questions. 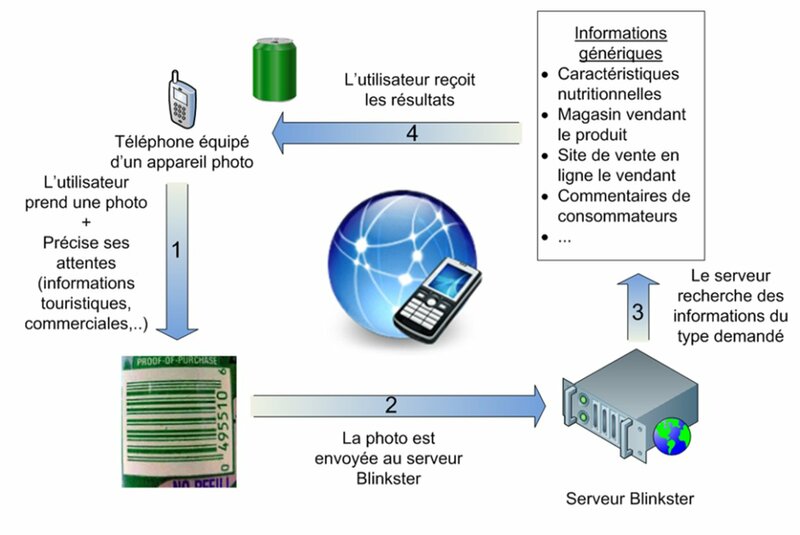 The Blinkster system works through an app based on the mobile phone and an online service hosted on the Net which puts it in communication with other Web services. The user can take a picture with is mobile phone and then choose one of the search « scenarios ». He will then receive a string of results according to his settings (photo, scenario). On a mobile phone, the interface is both simple and intuitive : after launching the application, the user sees a window pulling up content from the phone’s camera and options toward different search « scenarios ». The user can then take a picture and send it as a request to the Blinkster server. To get better results, informations from the phone’s sensors are sent along the photo (GPS, geolocalization, language) and the search « scenario ». The picture is then sent to the Blinkster server for analysis : it pulls up keywords through identification patterns (comparisons of pictures, logos, OCR, barcodes etc…) and uses those keywords to find results relevant to the user’s situation through heuristics combining its own database and services from the Web. The final result is presented as a well formated list adapted to the phone’s screen. The user can customize his app for comfort, through the display of different « scenario » buttons. All this, with the use of a simple, natural gesture : aim the phone and click, without any intermediary manipulation. A step closer to augmented reality : what the user sees can be seized instantly and precisely associated with organized content. If he wishes, the user can also contribute to the platform by adding informations to Blinkster’s database. This can take the form of a next, or even a simple grade of one or several stars. This contribution will be indexed and accessible to the rest of the users. This unique gesture (aim and click) will be able to answer a great deal of questions encountered daily, along various scenarios. The first version of the app will support a limited number of scenarios and then will be gradually enriched, according to the users’ needs. -a detailed commentary, and complementary informations. -indications toward associated works of art. -commentaries from users around this work of art. -interesting destinations around the user’s location. We are also looking for an experimental « Translation Scenario ». -the flexibility of the client/web architecture to add new sources and new functions. -the relevance of the results, adapted to the format of the phone. The possibility to export our app toward different mobile OS, even toward versions targeting an audience not yet quite used to mobile apps : with an extra-lite interface, less buttons and contrasted results. The Blinkster project is divided between the server and the client app. The Blinkster project will be initially supported on two mobile OS. To ensure maximum efficiency Blinkster require a mobile phone with a camera and unlimited 3G access. This is why we directed our efforts on the iPhone and the Android platforms. The Android app requires at least the version 1.5 of the system. The app weights 10Mo, with its intern database for archival and off-line access. the server platform requires a cloud-computing platform.